With spring around the corner, now seems like a good time to talk about how to organize Montessori materials. I’m sure there are many Montessori classrooms (either at home or school) that look beautiful at first glance – with gleaming materials on polished shelves. A closer look might reveal drawers, cabinets, and closets that would require a team of excavators to find that elusive tray or dusty puzzle. Even as a pretty organized person, trying to figure out the best way to organize my materials – the ones we’re not currently using – has been one of my biggest challenges. Are 3-part cards best in baggies, envelopes, accordion files, or photo shoeboxes? Should items be grouped by type (cards, books, charts) or by curricular area? Well, I’ve tried many different methods and I think I’ve finally found one that works for me. It’s a combination of plastic cabinets with drawers, Ziploc bags, plastic shoeboxes, and photo shoeboxes. I’ve labeled each drawer: the left cabinet is Biology (Botany & Zoology), Language, and Math; the right one is History, Geography, and Geometry. The other cabinet has Physical Science, Practical Life, and a second Math drawer. In these drawers, I put mostly objects and manipulatives. Card materials and charts I keep somewhere else. I really like these carts for several reasons: they don’t take up too much room, they’re easy to wheel around, and you can also put things on top of them. Right now I have one in my own closet and one in my daughter’s closet. Within the drawers I use small boxes and baggies to keep things separate. I use mailing address labels that I put on the containers to tell me what’s inside. I go through the drawers every so often, swapping materials with those that are on the shelves, or trying to think of new ways to use things. Recently I went through them with a heavy hand and threw away things I had never used – or things of which I now have a better version. 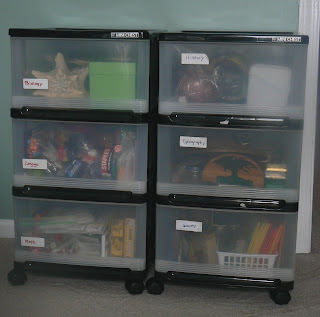 Next time – my Montessori closet!